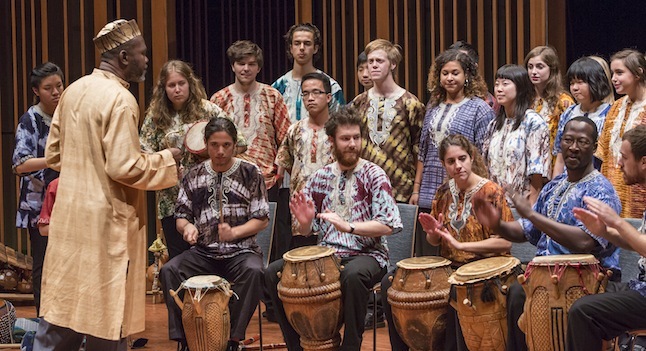 The Macalester African Music Ensemble, founded in 1987 and directed by Sowah Mensah, performs traditional African music primarily from Ghana, but also from Nigeria, Zimbabwe, Guinea, The Gambia, Kenya, and Tanzania. In addition to singing, the Ensemble performs with a variety of African instruments including xylophones, marimbas, flutes, horns, an assortment of drums and gourds. The 40-member ensemble is open to all members of the Macalester College community. Auditions are held once a year in September; no prior experience in African music is required. The Ensemble performs frequently throughout the school year for schools, churches, and the community. In January, the Ensemble holds concerts at Macalester College for schools in and around the Twin Cities metro area during a two-week period before the start of the spring semester. With an average of two shows a day, this January the ensemble performed for over 10,000 students. It is customary for the Ensemble to tour out of state in the Spring to play for schools, ending with a public performance for the community. The Ensemble has been to New York and New Jersey, Santa Barbara, CA, New Orleans, LA, Seattle, WA, Ann Arbor, MI, Chicago, IL, Madison and Milwaukee, WI, Iowa City, IA, St. Louis, Kansas City and Wichita, KS, Kansas City, St. Louis and Cape Girardeau, MO, Kasper and Riverton, WY, and Sioux Falls, SD. The Ensemble also plays three main performances at the college: one in December, one in February, and one final performance to close out the year in May. For the spring concert, the Ensemble frequently invites a guest performer from Africa to perform with the group. Additional performances include Macalester College commencement and church services which feature Ghanaian gospel music. The Ensemble has also been invited to perform on Minnesota Public Radio on numerous occasions. The Ensemble is directed by Sowah Mensah, an ethnomusicologist, composer, and a master drummer from Ghana, West Africa. Registration for ensembles is taken care of by the directors of the ensembles during the first week of classes. Be aware there is some lag time between when students turn in registration information to the director and when the class appears on records. 1 credit per semester, but only after two consecutive semesters of enrollment. Study abroad does not count as an interruption. Credits for ensembles do not count towards the College’s 18-credit limit. Ensemble credits count towards the Fine Arts requirement, but only if the student has registered for four consecutive semesters of the same ensemble. There will be one major performance in Fall Semester and two in Spring Semester.